The Ecstatic is a bizarre novel featuring a 315-pound African-American protagonist with possible schizophrenia, Anthony James, who relates his own story to the reader. We learn that James was a student at Cornell, but he dropped out and started cleaning houses in Ithaca instead. Eventually, his family drove up from their home in Queens and collected him to live with his grandmother, mother (who is on anti-psychotics), and 13-year-old sister. James is a sharp-tongued narrator. For example, here is how he describes his sister: "Nabisase was Old-Testament-beautiful; wrathful, privileged loveliness. A short girl with long legs and big thighs. Her face was mostly lips and chin." The most dramatic part of the novel is a family trip down to Maryland for Nabisase to take part in a beauty pageant for virgins. Novelist Victor LaValle writes with gusto but the style is disorienting and it is a challenge for the reader to maintain focus on the plot. Characters come in and out of the story and you are left with the feeling that if only you had paid more careful attention, you would have a better idea what was going on. Maybe James is an unreliable narrator, and it is hard to know how much to trust him. The rush of hazily-described events leaves the reader bewildered and looking for a way to sort out fact from fiction within the story, or at least get clear on what holds the story together. Take the start of chapter 29, for instance. " -- You got French fried, I told Ishkabibble, because he looked worse today than he had a week before. I couldn't stay home while my sister broke Sidney Poitier's chips into bits of dust. After tossing Mom's mattress around I needed to get out." It's as if the words have the form of a narrative but the words are so loosely associated as to make it impossible to follow. For most readers this will be off-putting. However, the energy in the writing is very appealing, and this novel bristles with different ideas and characters. The individual sentences are simple and punchy, and you really want to like the book. 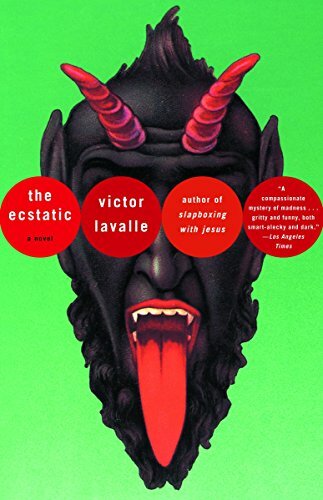 LaValle is a promising writer, and The Ecstatic is a striking novel despite the frustration it inflicts on the reader.